The new series of The British Bake Off is just 2 days away! It seems unbelievable that it was nearly two years ago when Jonathon Unwin, from Market Harborough Plumbing firm “Unwin Plumbing & Heating”, was working for former bake off winner Frances Quinn whilst she was having to keep the secret of her sucsess!! Jonathon was “the plumber” Frances mentioned in several interviews, as she was nervous he would find her hidden trophy and her secret would have been unveiled. 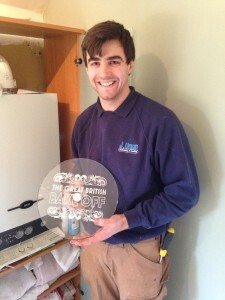 No trophy was found whilst the work was carried out but Jonathon was lucky enough to have his photo taken with it once the final was aired on the BBC.